Jair Bolsonaro said those who were protesting his drive to develop deeper ties with Israel had done nothing to help Latin America’s biggest country. 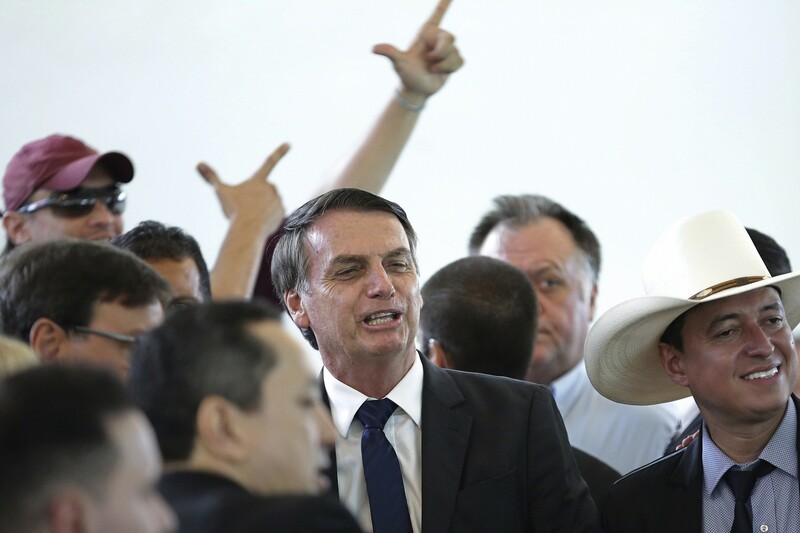 “There is no reason to criticize dialogue, especially when the criticism comes from those who did nothing, only destroyed and stole from the country,” Bolsonaro said on Twitter. He said Brazil was interested in technological services that Israel is a world leader in, likely referring to agritech and cyber security. “We want the best for Brazil,” he wrote. The comments came shortly after Netanyahu played up potential ties with Brasilia as he boarded a plane for Rio de Janiero to attend Bolsonaro’s inauguration next week. He said Bolsonaro was heralding “profound changes” in bilateral ties. Bolsonaro’s strong support of Israel won him praise from the country’s large evangelical population. But the strongman has also been criticized over his vow to move his country’s embassy from Tel Aviv to Jerusalem, and to close the Palestinian embassy in Brasilia. His election is seen as marking a hard-right shift for the country, which has traditionally maintained positive relationships with the Palestinians. In 2010, Brazil was the first South American country to recognize a Palestinian state based on pre-1967 borders. The Arab and Muslim world has warned Bolsonaro that a possible move of the Brazilian embassy to Jerusalem would negatively affect commercial ties. Brazil is among the largest exporters of halal meat to the Arab world, and exporters have reportedly lobbied Bolsonaro not to move the embassy and risk harming the industry. Netanyahu is expected to land in Rio de Janeiro Friday, where he will hold meetings with Bolsonaro, Defense Minister Fernando Azevedo e Silva and Foreign Minister Ernesto Araujo. On Monday, he is scheduled to fly to the capital, Brasilia for several events at the Presidential Palace, the Foreign Ministry Palace, and at the National Congress surrounding the inauguration. Earlier this week, sources in Netanyahu’s office told Hebrew-language media outlets that he is considering cutting his trip short due to the political developments in Israel. But on Wednesday evening, after the Knesset voted to disband and hold early elections in April, the prime minister decided to go ahead with the original travel plan. “Bolsonaro’s election marks a new era in Israel-Brazil relations and he fully intends to strengthen this relationship on all levels — political and economic — throughout his tenure,” Leah Soibel, the founder and CEO of Fuenta Latina, a Jerusalem-based nonprofit seeking to improve ties between Latin America and the Jewish state, told The Times of Israel this week. “Step by step, methodically and persistently, we are turning Israel into a rising global power,” he told his cabinet Sunday. “Brazil is a huge market, almost 250 million people; the opening of this gigantic market will create new jobs in Israel and will greatly help the Israeli economy,” he added. Even before Bolsonaro’s election in October, trade ties between the countries had been picking up for years. In March, Israeli Science Minister Ofer Akunis traveled to Brazil to work on trade agreements, with bilateral trade already surpassing $1 billion annually. Brazil is also among Israel’s largest buyers of defense equipment. Last year, a Brazilian subsidiary of Elbit Systems Ltd., Israel’s largest non-government-owned defense company, signed a $100 million framework contract to supply the Brazilian army with remote-controlled weapon stations. This entry was posted on December 28, 2018 at 10:01 AM and is filed under Uncategorized. You can subscribe via RSS 2.0 feed to this post's comments. You can skip to the end and leave a response. Pinging is currently not allowed.